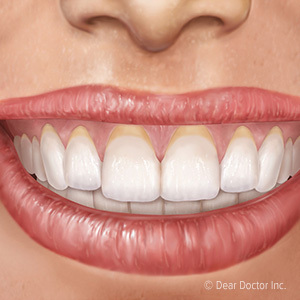 It's surprising just how much pain an infected or inflamed tooth can cause. Simple things, like taking a bite of a sandwich or drinking a cup of coffee, can send your pain level soaring. Fortunately, root canal therapy can end your pain. Our Andover, MA, dentists - Dr. Nicholas Papapetros, Dr. Jhon Giraldo, and Dr. Leo Kharin - offer the tooth-saving treatment at Dentistry by Design. The center of your tooth is filled with a collection of connective tissue, nerves, and blood vessels called pulp. When the pulp becomes inflamed or infected, you may experience pain and a range of other unpleasant symptoms. Your risk of an inflammation or infection rises if you have extensive decay, injured your tooth, or had more than one dental procedure on a tooth. You may also be at increased risk if you have a crack in your tooth that allows bacteria to reach your pulp. An inflammation or infection in the pulp won't go away on its own. If you ignore the pain, you may lose your tooth and put your health in jeopardy. Root canal therapy is the only way to treat your symptoms and relieve your pain. Before treatment begins, you'll receive local anesthesia to ensure that you don't feel pain during the procedure. Once the anesthesia takes effect, your Andover dentist will open the tooth and remove the pulp. He'll also clean the interior of the tooth and use tiny files to clean and shape the small root canals that travel into the roots from the top of your tooth. In most cases, you'll receive a temporary filling after the pulp is removed and will return to the office for your permanent filling in about a week. Your tooth will be filled with a flexible rubber-based filling at your second root canal appointment. A crown may also be recommended, as the root canal procedure can weaken teeth. Protect your tooth and ease your pain with root canal therapy. Call our Andover, MA, dentists - Dr. Papapetros, Dr. Giraldo, and Dr. Kharin - of Dentistry by Design at (978) 475-5333 to schedule your appointment.